Special Response Corporation is a leader in providing security for work stoppages, natural disasters and other needs nationwide. Based in Hunt Valley, Maryland, Special Response Corporation provides security for clients throughout the United States. For over 25 years, Special Response Corporation’s expertise and experience in the field have proven successful for client after client. 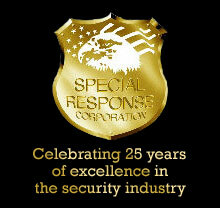 The standards of Special Response Corporation are what set us apart from our competitors. Every employee must have either military or police background and goes through rigorous background screenings and training to become a Special Response Security Professional. With this base, our employees maintain only the highest level of professionalism and provide our clients with the best service available. Our commitment to customer service and to our client is why Special Response has become the highly regarded Security Firm that it is known as today. Our areas of expertise range from, protecting management and company assets during a strike or other labor unrest to providing security to prevent looting and other situations after natural disasters. Special Response Corporation’s company resources also allow us to provide support for clients in the form of catering services, mobile housing, shower, and laundry units, and through our TeamWorks USA division, temporary labor. As with our security professionals, all of our equipment and support personnel are held to the highest standards. 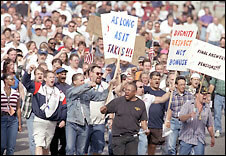 Clerical employees who walked off the job at the ports of Los Angeles and Long Beach last week returned to work Monday, but their union and employers have not yet returned to the bargaining table to negotiate a new labor contract. Thank you for your continued cooperation and support for our security needs. We appreciate the level of professionalism Special Response has provided despite several adverse conditions.